A prime example of casino site naming by numbers, Dream Palace Casino was established in 2014 with a clear idea that glitz and glamour were the themes that were going to entice in players. This is not necessarily a bad logic to have, as the concepts of affluence, elegance, and decadence have been hugely successful for other sites, but it feels a little ham-handed here. That being said, when you scrape away the basic theme, Dream Palace Casino has a lot to offer players of all standards. To make an impact on the busy online casino market, a site needs to bring a sense of something different, and focus on customer satisfaction, and it certainly appears that Dream Palace has made a conscious effort to do that. Dream palace Casino looks much like you would expect it to from the theme, but this is one of those occasions when being predictable is not necessarily a bad thing. When you come in with a name like Dream Palace, thinking outside of the box too much would ostracise those players who had been tempted in by the promise of familiarity, and a basic concept, which is exactly what you get here. The site looks fairly attractive, the use of neon is limited, which is nice as sites with this theme often overuse that particular idea, the predominate colour in the scheme is blue, and the night time cityscapes that you have grown to know and love at such sites are here in full force. Using a variation of the Vegas theme may seem like a cop out, but Vegas is still a hugely popular destination for casino players, and this popularity is echoed amongst online customers, so this theme was always going to catch the attention of a good amount of players. If you are a fan of unique and different design concepts, then maybe don’t make Dream Palace Casino your next stop. However, if you feel that unique is being overused and has got to a point where many sites’ design ideas are just silly, then this will be a refreshing site for you to play at. Being predictable may bring a certain level of comfort in terms of design of a site, but when it comes to games, you need a balance of favourites and new games. With software providers including big names such as Microgaming, NextGen, and Thunderkick, Dream Palace Casino is clearly trying to make an impact with its games. Slots fans can enjoy over 250 slot games here for desktop players, and close to 100 that are available for mobile and tablet players. The slots you’ll find here include 11 jackpot slots, the most well-known of which being Thunderstruck II and King Cashalot. You will also find a strong selection of favourites including Starburst, Gonzo’s Quest, South Park, Stardust, Foxin’ Wins, Game of Thrones, and many more. Table and card game loves will find as good a collection of poker, roulette, and blackjack variations as you will find anywhere, as well as baccarat and others. There’s also a handful of scratch cards for instant win games. 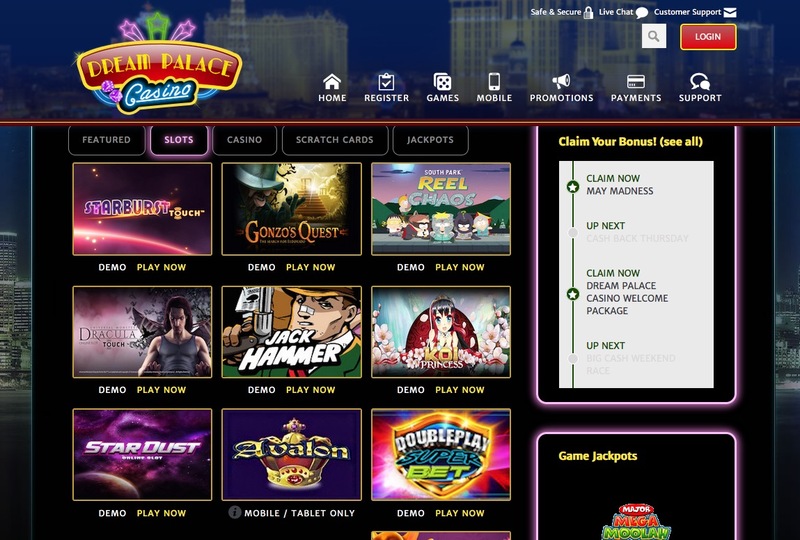 Despite what its name may lead you to believe, Dream Palace Casino actually makes a real effort to be customer focused and give players what they want, and that comes across when you visit the site. When there is so much competition around, a site that is really trying to offer you everything you could want is definitely a good start, and makes Dream Palace Casino one to consider for players of all levels of experience.